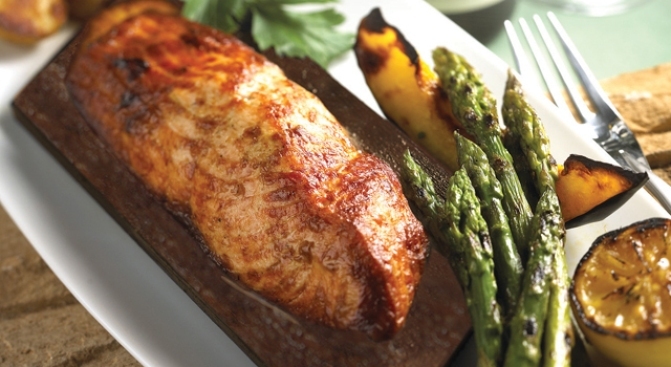 "It isn't always possible to...buy the ideal products"
The cedar planked salmon is served year-round. Is it better to give great service and affordable prices, or live up to your name? Foggy Bottom's Founding Farmers might be finding out the hard way, especially after it was taken to task by the Washington Post Monday for not always serving food that's family farm-friendly -- one of the restaurant's selling points. At the "upscale-casual" green-certified restaurant, for example, the cedar-planked salmon is advertised as "sustainable" -- but Founding Farmers serves farmed Atlantic salmon, a no-no according to seafood watch groups that condemn the pollution and other environmental impacts of salmon farming, the Post reports. Dan Simons, chief executive of VSAG, the management company that runs Founding Farmers and sister restaurant Farmers & Fishers (formerly Agraria) in Georgetown, said the restaurant is delivering on its goals: It is the first restaurant in Washington to receive the U.S. Green Building Council's LEED (Leadership in Energy and Environmental Design) certification. It uses organic cleaning products and biodegradable trash bags. The restaurant strives to buy from American family farms, some of them regional. But providing great service and affordable prices is as important. And, Simons said, Founding Farmers' brand is about more than just food. "We're not Equinox," he said, referring to the Washington restaurant that has built its reputation on a decade of promoting local farmers. "Is green [only] about what people put in their mouth? Or is it about the whole experience?" “Strive” is an important word, because in today’s world, and today’s economy, it isn’t always possible to source or buy the ideal products; no different than if you’re food shopping at Whole Foods you (and they) are striving for great products, but not everything delivers perfectly on our desires. Judging by the number of people going in and out of Founding Farmers' doors and comments on restaurant review sites like Yelp, patrons might not be just fine with the restaurant's striving -- and some are more than happy with Farmers' ability to "accomodate a range of budgets."